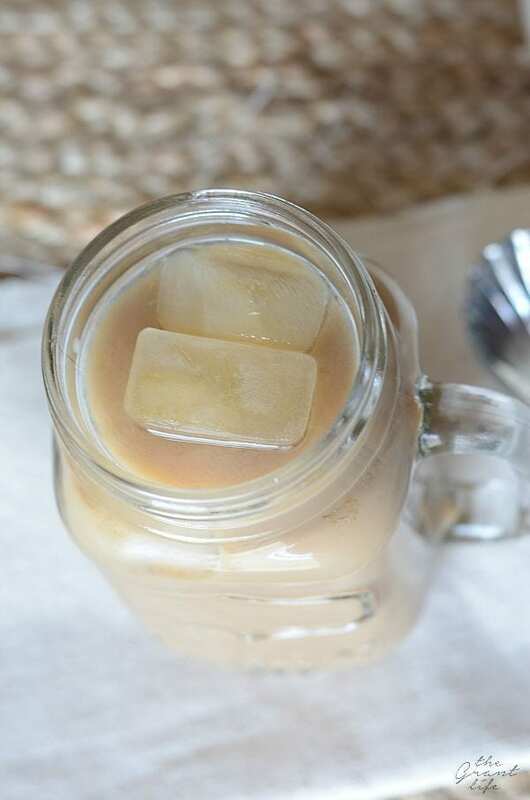 Spice up your iced coffee with this easy and delicious pumpkin iced coffee! Yes. Yes I am one hundred percent ready for it to be fall. And here’s why – I’m hot, yall. I know I am 10 months pregnant in the middle of summer. I know this. But when other people that I DON’T EVEN KNOW look at me and say “Wow, you must be hot”, then it’s beyond true. I’m hot and ready for fall. And no, I’m not even kidding about people telling me I look hot. We went out to dinner last week and a lady actually did a double take when she saw me and my belly. She apologized to me and said “you must be hot!” I agreed and said yes, even standing inside the restaurant I was hot and who’s idea was it to have a baby in the middle of summer. I then looked over at my husband who just smiled and shrugged his shoulders. The very nice lady then proceeded to fan me with her menu and I was forever grateful. I’ve also had friends hand me napkins and say “you’re sweating.” Yup. I sure am. Because I am 10 months pregnant, in July, and I’M HOT! Needless to say, I am totally ready for the cooler weather of fall. Plus, pumpkin. DUH. It’s pretty obvious that I am an absolute pumpkin fan. 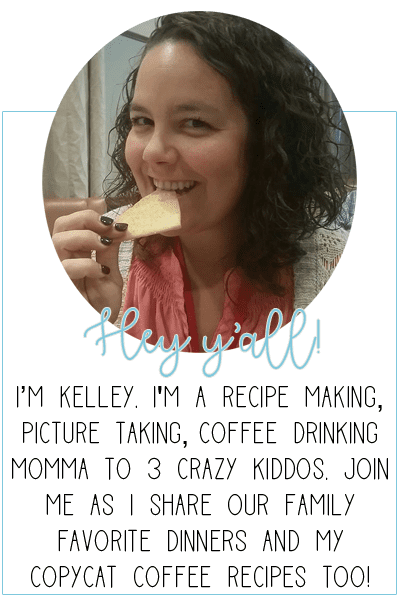 (See – pumpkin recipes!) Now add pumpkin to coffee and I am a raving fan. (It’s pretty obvious I love coffee too!) 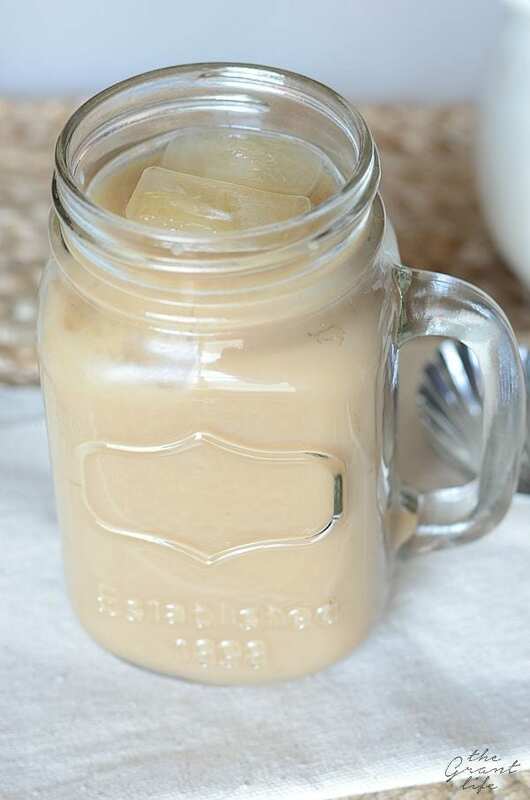 This pumpkin spice iced coffee combines all of things that I love about fall. Cooler weather, pumpkin and coffee. Plus, homemade whipped cream. Because, delicious. Put it all together and I am one happy momma! 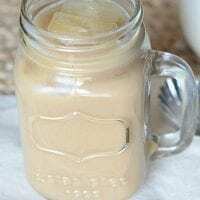 Mix together the coffee, milk and pumpkin syrup. 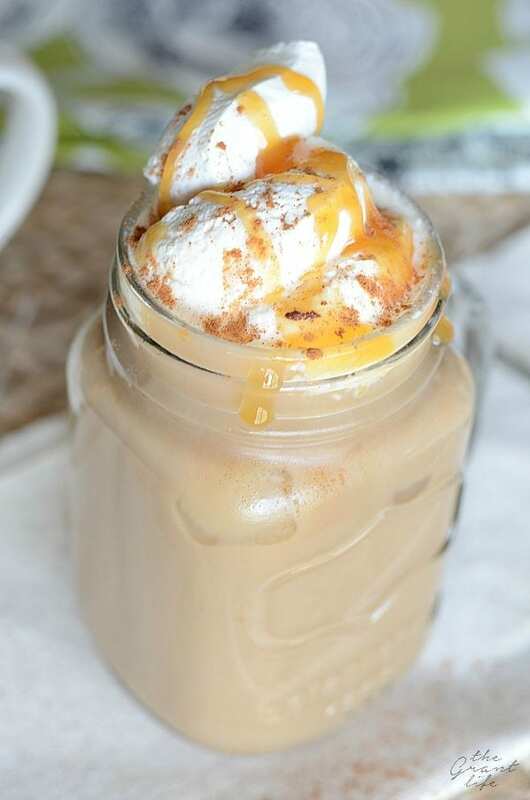 Top with whipped cream, caramel sauce and spice.